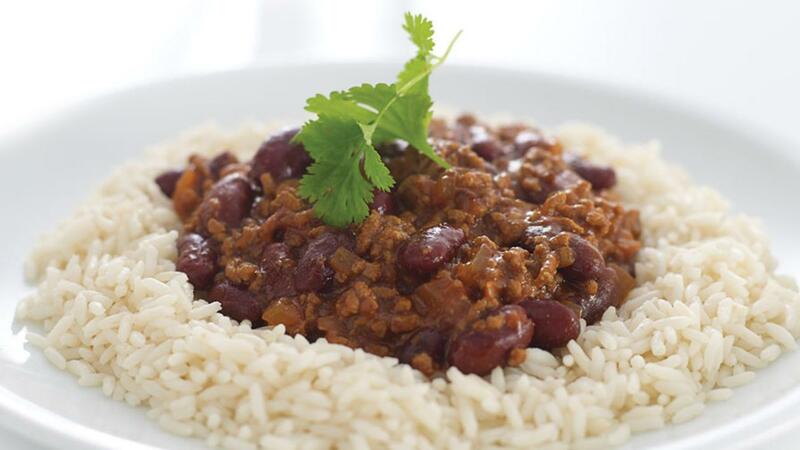 A classic chilli con Carne inspired by the Mexican cuisine. It is easily made from scratch and full of flavour by adding lots of herbs. Serve with sour cream and fresh coriander. Add the oil to a suitably sized saucepan and heat until hot. Add the onions and cook, until the onions are soft but not coloured. Add the crushed garlic, pepper, chilli powder, paprika and ground cumin. Stir the ingredients and cook for a further few minutes. Add the minced beef breaking it up with a spoon or spatula as you fry the beef, for at least 5 min., or until the mince has lost its raw look and is beginning to brown. Add 25g of KNORR concentrated jelly Beef bouillon directly to the pan along with about 200ml of water. Add the chopped tomatoes, marjoram, sugar and the tomato purée and stir the sauce well. Simmer the sauce gently for 20 min. with a lid on stirring occasionally. If the sauce looks dry, simply add a small amount of water until you are happy with the texture. Add the kidney beans and bring to a gentle simmer for a further 10 min. Add a little more water if the sauce is too dry. Season to taste, adding salt and pepper, if required adjust spice heat with more chilli powder or tomato puree. Leave to stand for 10 min. before serving. Serve with rice garnish with soured cream and fresh coriander.